vii) This gas was used in the First World war. Ans: Dobereiner arranged the elements in a group of three i.e. mad. Newland an English chemist, arranged, the elements in the increasing order of their atomic weights. According to him. (a) Differentiate between the natural isotopes of Hydrogen. ii) (b) Interstitial Hydrides are not true chemical compounds. Comment. Transition metals adsorb H2 gases molecule on Intrestitial spaces ,(empty spaces between atoms) It is called interstitial Hydrides, Properties of these hydrides apparently those of pure metals. Thats why they are not true chemical compounds. Reaction of litharge with Sodium chloride. There are two allotropic forms of sulphur. When sulphur is heated up to its bOiling point & quickly proved into cold water then a rubber like plastic sulphur is obtained. Its structure consist of long chains’S’ atoms coiled up its elasticity is due to uncoiling of long sulphur chains and then recoiling of on release of tension, hence it can be stretchable. 1. It is black rubber like material. 2. It is non-crytalline forms-of sulphur. 3. It is insoluble in water but soluble in CS2. The elements of a group in the periodic table have the same valence shell electronic configuration. 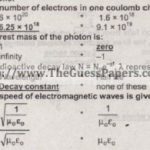 Since the properties of element have a periodic function of their atomic no (Z), the electronic configuration vary with increasing atomic no. in periodic maner. 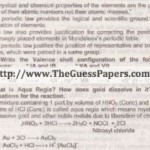 Hence In a group elements shows same valence shell electronic configuration. Alkali metals cannot be used in voltaic cell. Alakli metals shows high oxldation.electrode potential. Hence it can not be used in voltaic cell, which has water as solvent, to avoid the reaction of metal with water. but 4s electrons are lost first in ionisation. 4s orbitals has less energy then 3d, So it filled prior to 3d. But 45 orbit is outer most that why electron lost first fram 4s orbit in Ionization. Ligands are generally called Lewis bases. Lewis Base are electron doner since ligands are also electron doner to the transition metal incomplete compounded. Hence It is also called Lewis Base. 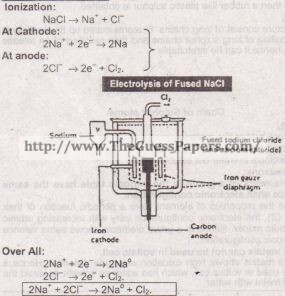 In this process a mixture of NaCI and CaCI2 is electrolyzed in a cylindrical outer iron cell lined with fire bricks. CaCI2 is added to decrease the fusing temperature of NaCI from 801°C to 600°C which makes the process feasible. The cell is fitted with a graphite anode and a surrounding by iron cathode. The two electrodes are separated by a cylindrical iron gauze. This keeps away the molten sodium which floats to the top of cathode compartment from CI2 formed at anode. Na-metal collects in the inverted trough ‘T’ placed over the cathode, rises up the pipe ‘P’ and is tapped off through iron vessel ‘V’. viii) How is Soda Ash manufactured by Ammonia Solvay process? 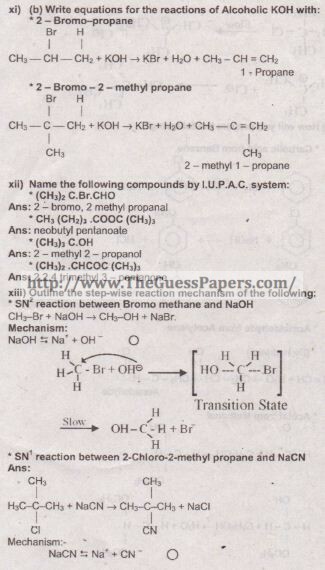 Ans: See on Page # 348.
ix) Describe the natural sources of organic compounds. Natural sources of organic compound: Following are the three main sources of organic compound other than plants and animals. 1. Coal: Coal is the decay product of plant which were buried millions of year ago. It is the source of hundreds of important organic compounds. It is found under the surface of earth at different depths. The main constituent of coal is carbon with some percentages of hydrogen’s, oxygen, nitrogen and sulphur. Anthracite coal, Bituminous coal, lignite and peat are some of its type. Destructive Distillation of Coal: Following are the three main fractions of coal when it is subjected to destructive distillation. 1. Coke: A solid material which is pure carbon and used as reducing agent in industries. 2. Coal Gas: It IS a gaseous product and used as fuel. 3. Coal tar: It is a viscous’ liquid and source of hundreds organic compound. 2. 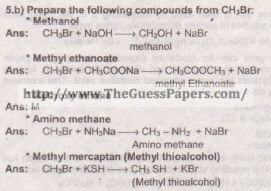 Natural Gas: Natural gas is also one of the important sources of simple organic compounds especially like methane. Methane is about 85% or more of Natural gas. Sui gas contain 94.6% methane it is mainly used as fuel. and oleum (oil). It is a viscous liquid mixture of various components. 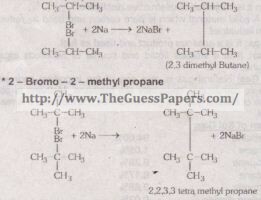 It contains alkanes, alkenes, cyclo-alkane & aromatic hydro carbons. It is also called crude oil. Both have molecule formula C2H60. The are Isomers . Numbers of small molecule having less molecular masses unit together to forms large molecule having high molecule mass called polymers, that phenomenon called polymerlzatlon. x) (b) ‘Acetylene shows acidic properties.’ Give two reactions to justify this statement. (2) Reaction with Heavy metal. 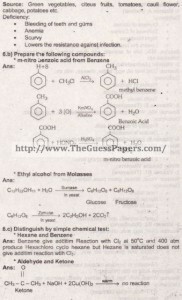 xi) (a) Which alkane is obtained by the reaction of metallic Sodium with the following compounds? 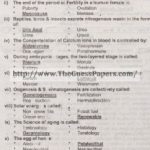 xv) (a) Give the biological importance of Carbohydrates. I. Ribose and deoxyribose which are aldopentoses, play an important part in human metabolism. They are found in nucleus of cells as RNA & DNA and are heriditory carrier. 2. Slow combustion of glucose in cell, provides energy necessary for our body functions. 3. Body stores part of glucose for rainy days in form of glycogen. In case of emergency glycogen hydrolyze to glucose, thus supply necessary energy. 4. Animal use cellulose of grass, plant, bark as their food. 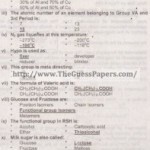 xv) (b) Explain saponification of oils and fats with the help of chemical equation. Write the names of the products formed. Saponification: Hydrolysis of oils and fats on boiling with a sol.of NaOH or KOH to form sodium or potassium salt of long fatty acid along with glycerol, is called saponification. 3.a) What is Metallurgy? Explain the extraction of 99.99% pure Aluminium from Bauxite ore containing silica as impurity. 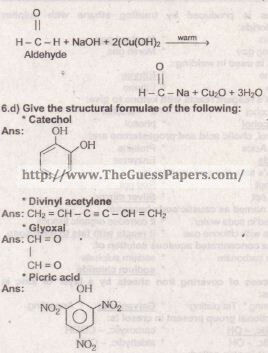 Ans: See on Page # 331. 4.a) Explain the manufacture of stable oxyacid of Nitrogen by Ostwald’s method. 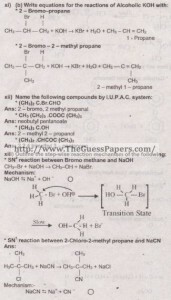 Write balanced equations for the reaction of HN03 with Cu and C.
Ans: See on Page # 334. A paint is usually composed of three components. 1. A binder = Hardens & form a continuous film. 2. A pigment = Supply desire color. 3. A volatile solvent = It evaporates. In oil-based paints, linseed oil is often used as a binder. The solvent is usually turpentine, a mixture of hydrocarbons obtained from pine trees. The pigment may be .titanium dioxide, carbon black, chrome yellow, oxides of iron or organic dyes of various colors. It is used to meke. Buttons, switches, electrical boards, cameras, radio and telephonic components. Photography is an art of producing picture of illuminating object on chemically prepared surface. A photo graphic plate or film consists of an emulsion of silver bromide & silver iodide suspended in gelatin coated to a cellulose acetate sheet. Silver bromide is light sensitive & undergo .photo chemical decomposition. On exposure to light some of the grains of silver bromide in the photographic plate undergo reduction to metallic silver. This film can be developed by organic reducing agents such as metal hydroquinone or prygallol, called developers. This reduces the sensitized silver bromid to Ag-metal. By this method the developed film reproduces the pattem of light that exposed it. This film is called the negative because -it is blackened with metallic silver where the light in the original image was most intense. The negative film is then fixed by immersing it in the fixing bath containing the solution of sodium thiosulphate called hypo. A positive print can be made by exposing photographic paper containing a coat of silver-bromide and silver iodide emulsion, to light that passes through the super imposed negative print. The exposed paper is finally developed & fixed in a similar manner. Ans: See on Page # 332. Structure: H3B03 forms white needle like crystals in which B(OH)J units are linked together by H-bonding to form infinite layers. These layers lie 3.18° A apart from one another & held together by vender waal’s forces, due to this reason they glide over one another. 1. Crystals of H3B03 are white, soft & silky. 2. It is greasy to feel. ,. 3. It is sparingly soluble in coM water buf readily soluble in hot water. 4. It is mono basic eak acid. .
5. It is mild antlseplic. 4.c) What is Corrosion? Write its causes. Give different methods for the prevention of metals from corrosion. 5.a) Explain the molecular orbital treatment of Benzene. 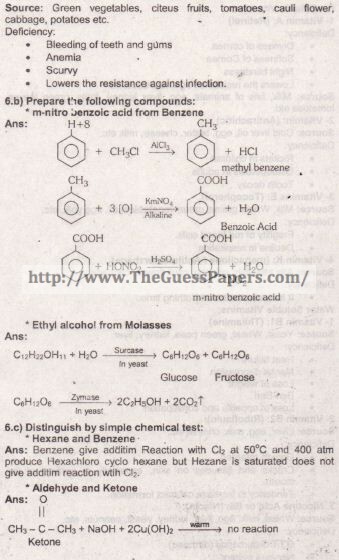 Also dl _·v the resonance structures of Benzene. 5.c) Draw the molecular structure of Ethene and discuss its orbital structure. 6.a) What are Vitamins? How are they classified? Write their names and sources. Also name the diseases caused by their deficiency. Vitamins: Vitamins are essential accessory of food factors which are necessary for complete normal metabolism of tne energy yielding constitutes of the diet and are must for normal body growth & development. 1. Fat Soluble Vitamins: It includes Vitamin – A. D. E and K.
Source: Milk, fats of animals, egg, liver kidney, fruits, green leaves, tomatoes etc. Source: Cold liver oil, egg, butter, cheese, milk etc. Source: Milk, Wheat grains, green vegetables, oil, egg yolk, etc. • Fragility of red blood cells. • It increase the blood clothing time. Source: Yeast, Wheat, green peas, kidney, liver. Source: Liver, egg, milk, cheese etc. • Cracks and fissuees on skin, especially at comers of the mouth. • Tendency to increase cataract formation. Source: Wheat, milk, egg, liver, kidney, yeast, peanuts, etc.